Sit with your group to figure out what you have in common and where you differ. Then come up with a theme to link it all together. Not sure what you have in common? How about music, sports, family, ethnicity, food, art, religion, dreams, goals, personalities, abilities, or favorite colors. 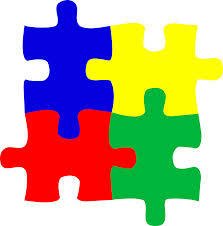 As a group you will create a Puzzle Speech with pieces that link - be creative. Your group must figure out a way to demonstrate to the audience the connection between your individual speeches.